Those of you familiar with the sport of quad rugby may have noticed a few familiar faces during the opening and closing segments of last week’s episode of NCIS: New Orleans. 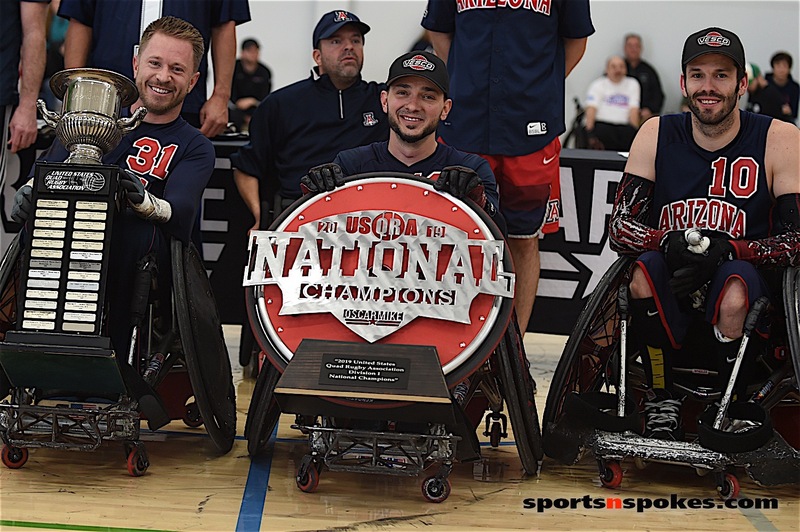 Members of Team USA Quad Rugby helped set the scene in NCIS: New Orleans’ episode, In Plain Sight. 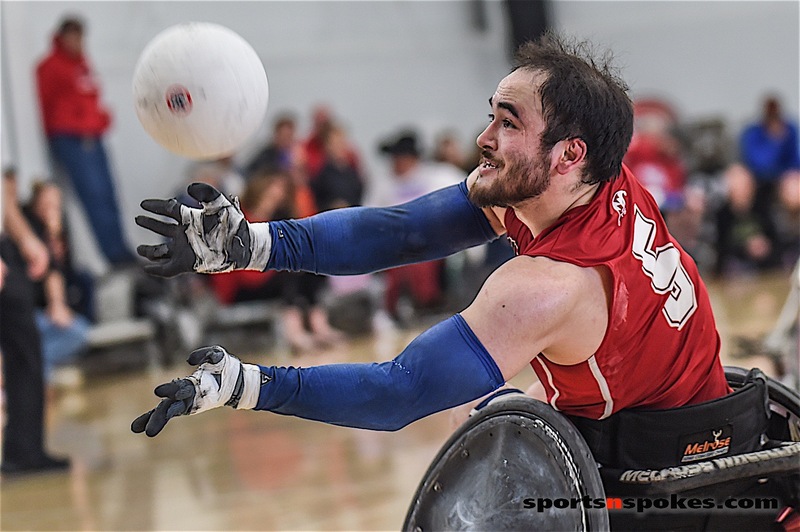 More than ten members of the team, accompanied by head coach James “Gumby” Gumbert, were contacted by the production team to play wounded warriors taking part in a recreational therapy session of quad rugby. NCIS: New Orleans cast shot with Kurt Yeager, Levar Burton, Scott Bakula, Katherine Beattie, Daryl Mitchell, and Teal Sherer. (Photo courtesy Teal Sherer). And while it’s not unusual to see actors portraying people with a disability, it’s not every day you get to see people with disabilities filling the roles. And while the tides are turning, there’s still a long way to go to address authentic casting. 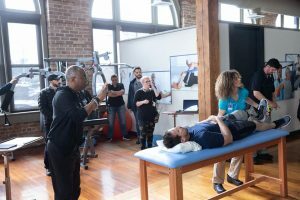 But Hollywood seems to be hearing the outcry for more authentic representation when it comes to actors portraying people with disabilities as is the case with NCIS: New Orleans. Of course, it’s helpful when your key writer (Katherine Beattie) and cast-regular (Daryl “Chill” Mitchell) are both wheelchair users. In Plain Sight is centered around cast-regular Daryl “Chill” Mitchell’s character, NCIS computer expert Patton Plame, who witnesses the murder of his rehabilitation mentor, Nick Taylor (Neil Hoover). It’s later discovered that Taylor was gathering classified material through the use of a skimming device implanted in his prosthetic leg. Patton insists that his friend was somehow being used and not a spy and the race is on as the team works to uncover the truth. We sat down with some of the NCIS: New Orleans cast and show writer, Katherine Beattie, to talk about the episode and see what the future may hold for actors with disabilities and their roll in Hollywood. 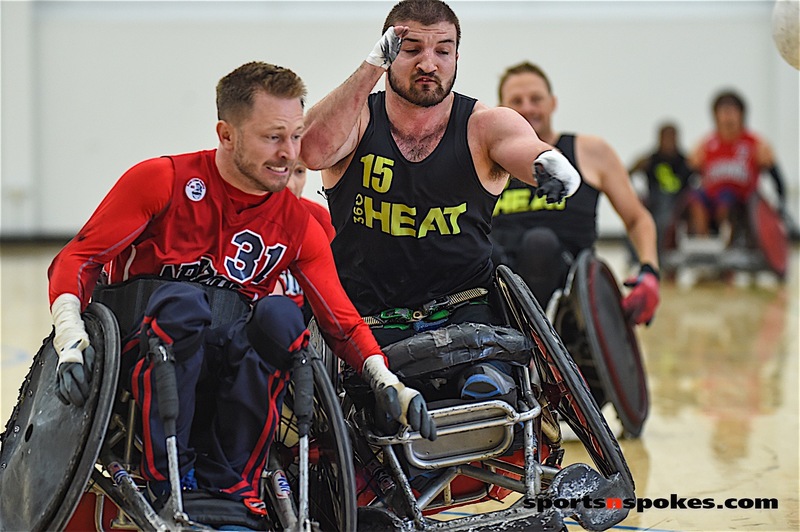 Beattie – I’ve been pitching a version of this story for a few years wanting to do something about wounded warriors, but we weren’t able to make it happen. We have a new show runner, Chris Silber, and we’re trying to give season 5 a fresh take. So, we really wanted to do a day in the life of Patton type-thing and focus a little more on his private life because all he ever does is sit behind a computer on the show. I started talking more about my own personal experiences like if you’re going to the movies or a concert or anything, you can pretty much sneak anything in with your wheelchair because they’re not going to ask you to get out of it so they can check it. So, I was just joking about how I can sneak stuff in places and that kind of became the inspiration for our show, our military show with disabled actors who would be sneaking around as spies and it kind of went from there. My boss, Chris Silber, pretty much let me run with it. I found it easy to write because I felt like it was my own personal experiences that I was able to pour into this police procedural which we don’t get to do very often. And that’s what we wanted to do with the episode is show that disabled characters can be anything they want … they’re not just a troupe or plot devise. SNS – Where you looking for bigger parts for Daryl’s character? Beattie – It’s hard on our show. Being there’s so much cobble stone [in New Orleans] and being that it’s so field-heavy is why Patton is usually in the office. It’s kind of hard to work him organically into cases but we know that every time we give him an episode he’s going to knock it out of the park. I think especially after this one, being able to get him out and get him actively involved in solving the case the audience has responded so well to that. I know I personally want to do more episodes like this in the future and I have to imagine that the writers would be on board as well just using his different perspective. Yes, we’re always looking for ways to get him more in cases because he’s such a good versatile actor. I’m excited for season six now that we set up this arch and got more of his backstory and personal life to find different ways to work that into cases in the future. SNS – How did you come up with Battle Brigade? Beattie – There’s a similar organization, a real organization called, Hero Corps and they train wounded or ill veterans to be cyber experts to work on child exploitation cases. We wrote it to include law enforcement and military veterans, but it was inspired by the Hero Corps. SNS – We understand that you had a great deal to do with the on-set consulting during shooting. How’s that feel for you? Beattie – It was so great to get my hands dirty and help produce the episode because I’m a story editor, which is kind of low man on the ladder in terms of writers. I’m always on set for episodes but never really got to feel like I had a place in producing. Because I’m so intimately familiar with the world of disabilities it was great to be able to take charge. This is my world but not the world of 99% of our crew and they really didn’t know what to expect so they were pulling me into all kinds of meetings. On set with NCIS: New Orleans shooting In Plain Sight with Kurt Yeager (on table) and Levar Burton directing. (Photo courtesy Kurt Yeager). It was great to really be able to work with Levar and bring what I have seen to life. Television is such a collaborative medium. There’s so many people that are involved in every shot that you see. And a lot of times as writers, we write the script and then we give it to the director and the cast and they run with it and make it better. And they certainly did that with this episode. But, I was able to be with them every step of the way which was a great experience. I’m looking forward to doing that for future episodes even if they don’t have anything to do with disability. SNS – What was the process of pulling together quality actors with disabilities like for you and production team? Beattie – We found great actors. I had said at the start that all of the actors we’d cast for this episode would be disabled actors. I made that clear but, in any case, for our show we always do authentic casting, so we knew we’d be casting disabled actors and put out the call and found Kurt, Teal, Sommer and Chill of course who are all fantastic. As for the rugby guys – they weren’t really even acting. They were doing their thing. It was easy for them. Levar was really hands-off and let the coach set the plays. It was funny because the production manager in our preliminary meetings was talking about hiring stunt guys to do the hits and stuff because he didn’t want any of the athletes to get hurt. I said two things. First of all, a stunt person is not going to be able to do this like an actual rugby player would and we don’t have to worry about hurting these guys. Like, this is what they do every day. SNS – What’s your hope for the future of disabled actors and how do you feel this episode will help? My hope is for disabled actors get more roles that are well rounded and not just like a troupe or plot devise and that they will get more and more opportunities. One of the things that’s big for me is the casting of disabled actors to play disabled roles and also casting disabled actors that aren’t actually scripted as disabled. I think with this show, everybody did such a great job – it was not difficult for us to cast these parts. It was an easy process. With the attention the episode is getting I hope that other productions will see that this is something that can be done and while it may require a little extra leg work up front to make sure things are accessible and in place, the end product is so worth it because you get an authentic story and the emotions are something that you can’t access unless you’ve had the real experience. I really hope that this episode serves as a jumping off point for the rest of Hollywood to start taking the issue of authentic casting more seriously. SNS – Do you feel that viewers will soon see characters like Patton as a computer specialist first and not a computer specialist in a wheelchair? How are you and your writers moving the script in that direction? Beattie – The interesting thing about Patton’s character is his character was not written as disabled. The character is disabled because Chill is disabled, and he was the actor that we cast. We found a great actor for the role who happens to be a wheelchair user. We always approached his character as the computer specialist … he’s our computer guy and what’s great about having Chill there is the fact that he is a wheelchair user and that adds so much more depth into his character. SNS – Share how much fun it was shooting this episode and seeing your words come to life. Beattie – Oh my gosh this episode was so fun and not only because it’s something I’ve been wanting to write for three years now but because I got to work with Kurt Yeager who is a long-time friend and Teal Sherer who was one of my best friends in Los Angeles before she moved away. 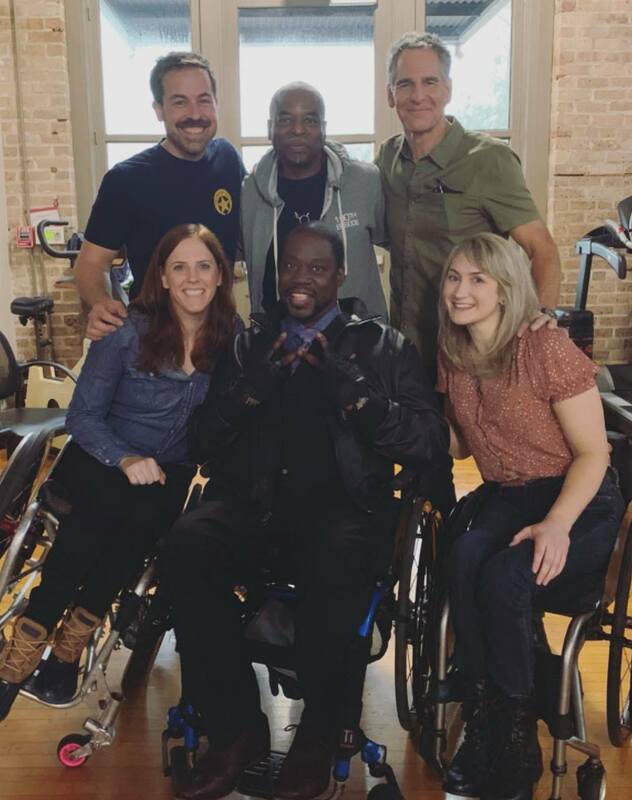 So, to be able to be on set with them again and collaborate in this way and to have all the able-bodied actors and crew come up and tell me that they have really taken something away from this experience and hearing guys tell me they wanted to play wheelchair rugby – it was a blast and I’m looking forward to doing more stuff like this in the future. Coach James Gumbert with director Levar Burton. (Photo courtesy James Gumbert). 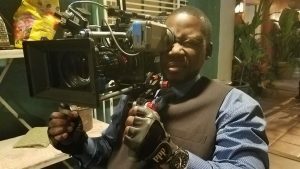 Gumbert – We’ve had some exposure in film in the past and got a call from the production team saying they were looking to do a story centered around our sport to be featured on a crime drama. 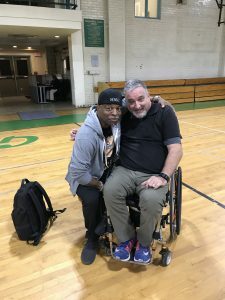 I met with Levar Burton, who would be directing the episode, who explained what he was trying to do and explained to me that one of the main characters on the show is a wheelchair user and the producers were looking for a sport the character could play. Burton wanted an incredibly diverse group of athletes for the segment. He provided a list of what he was looking for and we went out and found them. Male. Female. Different races. Different playing levels. Burton wanted the best players as well as those who were just getting started. Gumbert – What was really great about it was, the writers were in chairs, the actors were in chairs. Everyone was in chairs with some type of disability. Really in my mind, it was groundbreaking because, well I call people in chairs, my tribe. And all my tribe was doing everything. They were writing the story, producing the story and were playing in the story. It was so awesome to see ‘our group,’ not just being included, but leading. 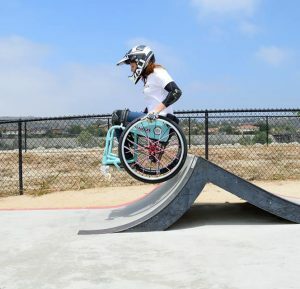 The episode was so powerful because so often, as the episode title refers, people in wheelchairs go about life in plain sight. I was moved to get on the set and realize there’s people in chairs writing a story just for you. It wasn’t about the chair. They’re in this show because they’re actors and you guys are in this show because you’re athletes. It’s so far from where we were and to be a part of that and experience it was special. No doubt about it. SNS – How many days did you shoot the rugby scenes? Gumbert – They gave us a script and said, coach here’s the deal. You’re going to be on at the beginning of the show and at the end of the show for maybe five minutes. I said, okay which I kind of expected. But the thing that was cool for our athletes was a lot of them are elite athletes. Paralympians. Their lives are so structured. You wake up, you eat, you go train, you come home, you watch film. There’s so much structure in their lives and to be able to come into a situation and see how other professionals do their craft and see them perform at the highest level and see the final product. That’s kind of revealing. Some of the best moments for me were of the athletes sending me pictures where they froze the TV on their face during the show. I felt like a proud daddy. SNS – How was working with Levar Burton and his direction throughout the episode? Gumbert – He came to me on the day of shooting and said, coach, here’s what I’m wanting to do and so we would draw plays and I asked him to tell me what the end result would be and then we’d set the play up and go over. There were so many big hits and we shot over and over with three different camera angles to try and get what they wanted. At one point Levar came over and said, coach, you’re making this too easy for me. I told him it’s these guys and gals making it easy for you. I’m just giving guidance. He was just really, really super accommodating and humble. He took the time to come to spend with each athlete and talk and take photos and hear about their life and why they’re in chairs. I mean, he didn’t have to do that. He was an incredible host and very gracious and humble. SNS – Were you happy with the final product? Gumbert – Man, people were like, there’s only three minutes of rugby and I’m like, you didn’t watch the show then. 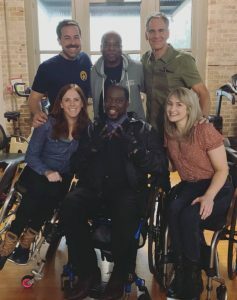 The show was what I was most impressed with telling the story about how people overcome, and all of the fight and drive and issues associated with a disability and at the end of the day being able to say they told an incredible story that hopefully changes people’s perceptions and attitudes. I just hope people see the rugby part and go, what is that and ask where can I see more of that? The coach in me wants that part but the person who lives with a disability was very impressed with the entire package of how they delivered the show. To see the final product and how it all fit together was neat. My hope is that people come back and want to know more about the game, the athletes and living with disabilities. 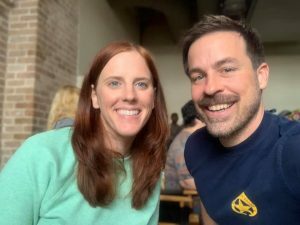 NCIS: New Orleans writer, Katherine Beattie and Kurt Yeager on set for In Plain Sight. (Photo courtesy Kurt Yeager). SNS – What did you think about the rugby team? Yeager – Oh, they were great. I saw them and I was literally asking how I can try that out. I just wanted to go bash into people because it looked so fun. SNS – Talk about the work you’re doing to help other actors with disabilities. Yeager – I’ve taught a few classes and I’ve been on the Performers with Disabilities SAG and AFTRA committee for eight years. We try to work with the Producers Guild of America (PGA), the Casting Society of America (SCA) and the Writers Guild of America (WGA) and encourage the writing, producing and casting of people with disabilities in disabled and non-disabled roles. SNS – Talk about your role in last week’s NCIS episode and how that all came together. Yeager – Having gone through something similar, I was able to tap into that. I have a lot of friends who have become disabled over the years and I try to help. You know it’s a “club” that anyone can join without warning. I was able to tap into that type of character because of all the experience I’ve had in real life. I thought about when I was lying in a hospital bed for three and a half months not sure what was going to happen. You feel like everything around you is collapsing and you’re looking for the one thing that you can hold on to when it’s all being taken away. I think that’s what this character got to. He had to focus on the one thing and ignore it long enough to get better. Which we all do in some capacity. SNS – You and Chill had amazing chemistry together and the moments you shared on screen were powerful in how newly injured people may be feeling withdrawn, angry or hopeless. How much of that did you pull from your real-life situation? Yeager – I think when you cast people with disabilities in either disabled or non-disabled roles, they come with a unique perspective and a unique level of experience. They come generally with tenacity because they have to figure out problems, so they become problem solvers. I think that was heightened between my character (Simms) and Patton [Daryl Mitchell]. Because we both know the different stages, and both have actual empathy because we’ve been there and it’s hard. It’s hard to replicate that if you’ve not gone through that. It’s hard to replicate that if you don’t really understand. SNS – Talk about what it was like being on set with so many other disabled actors, extra and staff. Yeager – Yea it was great. You also had a bunch of amputees like Neil Hoover who played Nick Taylor and Sommer Carbuccia who played our bad guy in this episode. And then at the training center, some of those guys were veterans with missing limbs. It was kind of like, in a way, kind of like being home. Like, we came in and did our job. Levar Burton was there guiding everything and getting great performances from everybody. This [episode] felt like a major step forward in Hollywood. It showed that not only can actors with disabilities do well as actors, period, but they can send messages to audiences that are powerful and useful that will bring eyeballs to projects which means dollars. It was cathartic. SNS – Talk a little about writer, Katherine Beattie and her script and how she helped bring this story to life. Yeager – She was there every single moment. Giving advice, working with Levar and offering her two-cents and making sure things were done authentically. She wrote a brilliant episode. Absolutely brilliant. She is very, very talented and I look forward to seeing her career blossom even more and hope she gets her own series soon. She is crushing it. SNS – Do you think there’s potential for more appearances on NCIS for you similar to Chill’s character? Yeager – It probably just depends on how much press that episode gets. Tag social media with #NCISNewOrleans and the producers and CBS. That’s what they want to see. They want to latch onto a popular, well-told story. If people believe that’s what we did, then we really need everyone’s support. Teal Sherer and Kurt Yeager in a snippet from NCIS: New Orleans. SNS – What have you been doing since My Gimpy Life? Sherer – Yea, well … acting wise I showed up in the Starz series, Survivors Remorse, and then I had a baby who is four now and of course I just did this NCIS episode and I’ve been writing and working on a children’s book and I’m on an adaptive rowing team. That’s been a lot of fun, rowing. It’s been a great workout and great to get out on the water. I’m also going to be Skyping to a college class who had to watch the show as part of a disability studies class and I’m going to be doing a Q&A with the class. It’s kind of funny to think the kids are “forced” to watch My Gimpy Life and then have to write about it and discuss it in class. It’s something I never expected to happen. To become part of academia. Sherer – I’ve been friends with Katherine for a long time, so she mentioned that there was a role that I’d be right for in her episode and then my agent submitted me for it and I sent in an audition on tape and then got the part. They flew me to New Orleans for a wardrobe fitting and filmed the following week for two days. It was great. I’ve known Chill for more than ten years. We shot a NBC pilot together but it didn’t get picked up and have known Kurt for a while so it was fun to reunite with everyone on set. And of course, Katherine. I was defiantly very honored to be there doing something very ground breaking and exciting. It was just fun to be part of it. It’s something that hasn’t been seen before. It’s written by someone with a disability, you have the series regular, Chill and then all the co-stars and guest stars with disabilities, the back-ground actors. There was so much representation and points of view in the story. Not just the one stereotypical view of disability. SNS – What’s been the feedback from the episode? Sherer – There’s been a lot of feedback. I posted a picture of us on set onto social media. I think it’s been my most liked and shared Facebook posting ever. I’ve heard from several people within the disability community that they really connected with the writing of the episode and the moments they could really connect with as a person with a disability. And I think what’s so cool about NCIS: New Orleans is that it is a prime time show so a lot of people watched it. SNS – How do you feel this episode helped the future of actors with disabilities? Sherer – Overall in general I’m seeing more people with disabilities on TV, theater and even Broadway. 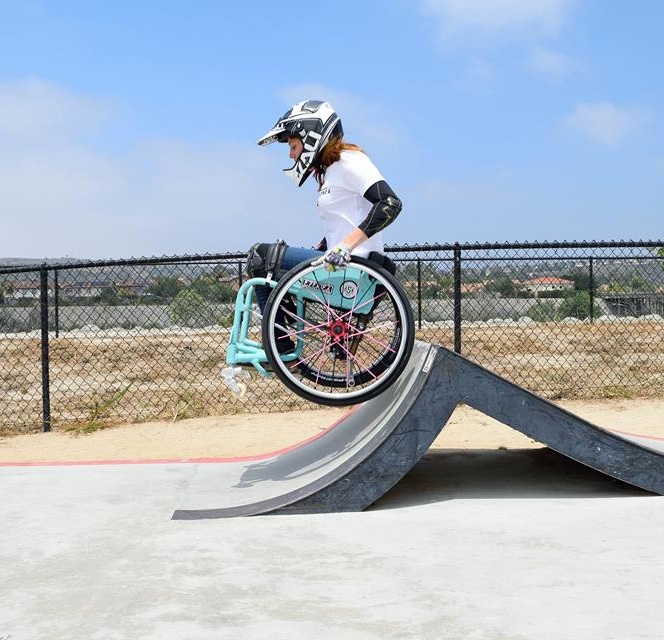 In many ways, I think it’s an exciting time for people with disabilities. You have a lot of exciting things happening right now. My friend Ali Stroker is currently in a revival of Oklahoma and it’s her second time on Broadway playing roles that aren’t even disability-specific which is super exciting. We’re always talking about disability representation in front of the camera, but I also think it’s important to look at the representation behind the camera like with Katherine as a writer. It’s so important that we’re telling our own stories. And I think that’s what’s so exciting about NCIS: New Orleans is we told our own story. 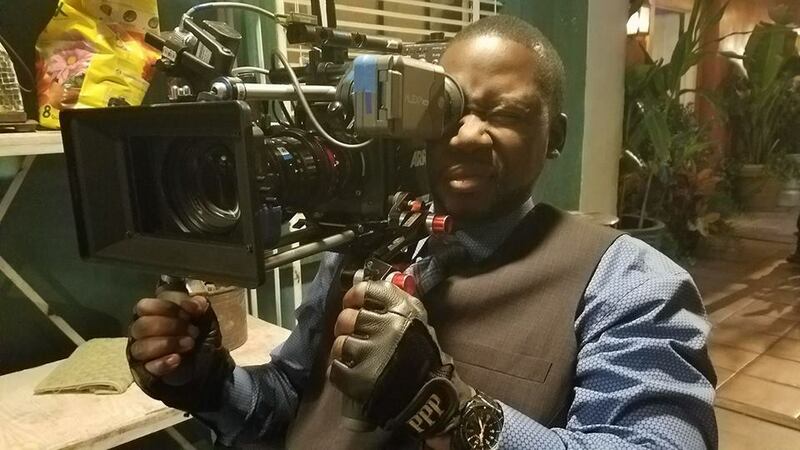 Daryl “Chill” Mitchell taking a peak behind camera on the set of NCIS: New Orleans. (Photo courtesy Chill). Chill – My nickname comes from a three-man rap group known as, Grove B. Chill we formed on Uptown Records label at a time when Shawn “Puff Diddy” Combs was just an intern at the record company. That’s what started off my career. I went to California for two weeks and ended up staying for ten years. In 2001 while on vacation in South Carolina my nephew asked me to ride his motorcycle to try it out. I’ve been riding since I was ten years old, so it was nothing to me. My mistake was riding at night with no lights in the south and not knowing the road. And when I went on one side it was good but when I came around the other side, the road was washed out and I slide on the road and ended up in a ditch with the bike on top of me. It was two weeks in the hospital and four months of rehabilitation at the Shepherd Center in Atlanta. One thing I know in a situation like that. You’re going to have no time to decide. You can’t ponder. You have to decide right in that moment. I’m not lying down in this bed. You can’t wait for the pain to go away. You’re always going to live with some sort of pain, but you have to be willing and ready to fight through it. And I got out of the hospital and they called me for a TV show called, Ed. I met with the producers. It wasn’t like they were looking to hire somebody in a wheelchair. But after we sat down and talked and met, they put me on the show. And that was it from that point. I had my own show called, Brothers. It was one of the best short-lived experiences of my life because they gave me so much responsibility and made sure that I lived up to it. Fast forward. Here I am on NCIS: New Orleans. Chill – I was fishing in South Carolina with my dad and they were looking for me for two episodes of the show. Two turned to 12 and 12 turned to a regular and from that point forward, we’ve been rolling. Basically, Patton wasn’t written as a disabled character. Him and Pride (Scott Bakula) had a relationship and Patton got into a situation and basically in exchange from being locked up, Pride made a deal with the people that he’d come work for them as part of a condition for his freedom. That’s how Patton first came to the show, but it was never dealt with about him being disabled until an episode called, The Accident. But this episode Katherine put together … man, she nailed it. I mean it was good because to have that many people, guest stars, co-stars with disabilities, extras with disabilities. I don’t know if a TV show has ever done that outside of a documentary. SNS – What from your personal life do you bring to the Patton character? Chill – I’ve had that conversation a few times with a few people. I tried to put as much of me into that character as I could because the message was so powerful. I know a lot of times I’ll be having a conversation with people [newly disabled people] about situations such as that. It was great to be able to have that vehicle to express those situations, feelings and thoughts to millions of people. So many people deal with things in silence because we cannot discuss our disability. It was great to be able to say what I said to Kurt’s character because, like I said, it reached millions of people who might say, I can relate to that. SNS – Talk about shooting In Plain Sight. The sights and sounds of the set, working alongside the other actors with disabilities and the reactions from the able-bodied actors. Chill – The fact that they work with me on a daily basis helps a lot because, not just the cast but the crew as well. The crew knows how to get out the way, they know if no one asks you for help don’t bother them because sometimes you’re more of a hindrance than a help. They feel me and know I’m as crazy as everybody else. When we come into the room. We’re ready to go. SNS – Do you feel this episode will show Hollywood the importance of authentic casting and how do you see the future for actors with disabilities? Chill – My whole thing is. I always say, at least give the person with the disability a chance. That’s all they want. An opportunity and a shot at the role. A lot of times they don’t even let you in the room. I’ve been through that. I’ve been through it as an African-American actor at auditions for roles written for a white guy, but in the end, they cast me. Once I get in the room they get to see something different. I’m not saying I’m the most talented guy in the world, but I know my way around the camera. And that’s all they’re asking is for a chance. Just because you walk don’t mean you can act. And just because you’re in a chair doesn’t mean you can act. I’m not in these shows just because I’m in a chair. I was proven before I got injured so the one thing I will get is a shot at the role. And most the time when they give me a shot, I close the deal. They just want to see what the actor can do. I don’t care what it is … give the person a shot before you close the door. Chill – Before anything, you have got to study the craft. A lot of times, even able-bodied actors just see what others are doing and think I can do that. Try to get hired as an extra and be around the set to see the long hours or when it’s cold and you have to work outside. See what other things you can be involved with on set or around a production. Study, study, study. That’s the main thing. Watch old movies. You’ve got to study just like anybody else if you want to be respected like anybody else. They’re not going to hire you just because you’re in a chair. Most of the roles I’ve gotten had nothing to do with a chair. Even roles written for people with disabilities. I’ve auditioned for them and didn’t get them. A lot of the times, it’s not about you being disabled. You just are not the type they’re looking for. You have to be thick-skinned in this business. As an actor with a disability, you’ve got to be thicker-skinned. 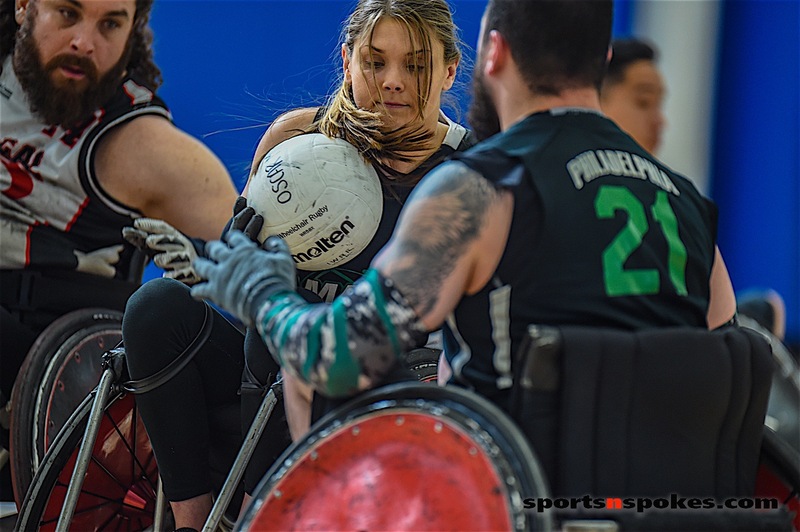 SNS – So, what did you think about playing quad rugby? Chill – I loved the shock on their faces [cast and crew]. That’s what I loved. When they heard those chairs crash, they didn’t know what they were looking at. One of the things that I loved seeing was that when we wrapped, when we said cut, everybody ran to get into those chairs and get a chance to see and experience what it’s like to feel that crash. I mean they were flocking to get into those chairs and meet the real guys who played the game and run into them. One guy had told me, I’m not into sports Chill, but I would watch this. It was good for those guys to get that exposure and be on TV. It was a real big deal to them. Check out NCIS: New Orleans on Tuesdays on CBS.